Deu_16:15 For seven days you are to celebrate in the presence of the LORD your God at the place where the LORD will choose; for the LORD your God will bless you in all your harvest and in everything you do, and your joy will be complete. From H8055; blithe or gleeful: – (be) glad, joyful, (making) merry ([-hearted]), rejoice (-ing). Hebrew. Literally, joyous festival. This is an appropriate greeting for just about any holiday, but it’s especially appropriate for Sukkot, Shavu’ot and Pesach (Passover), which are technically the only festivals (the other holidays are holidays, not festivals). After having followed the Feasts of YHVH for the last several years, I can attest to the joy that comes from observing His Feasts. He always blesses us when we are obedient to meet Him at His appointed times. That is Joy! And it is a mere shadow of the complete joy that is to come! Do you see? It is all a part of God’s plan from before there were even human beings with eyes and ears or their own imaginations! From the beginning! How amazing that our Creator loves us so much He made a way for those who love Him to dwell with Him forever! If joy is found by those who claim to be ‘born-again Christians,’ maybe we should examine what that phrase means! Jesus answered, “Truly, I tell you with certainty, unless a person is born of water and spirit he cannot enter the kingdom of God. From G507; from above; by analogy from the first; by implication anew: – from above, again, from the beginning (very first), the top. IN VERSE 3 HE SAYS YOU MUST BE BORN OF WATER AND SPIRIT. G5204 hudatos hoo’-dor, hoo’-dat-os, etc. From the base of G5205; water (as if rainy) literally or figuratively: – water. From G4154; a current of air, that is, breath (blast) or a breeze; by analogy or figuratively a spirit, that is, (human) the rational soul, (by implication) vital principle, mental disposition, etc., or (superhuman) an angel, daemon, or (divine) God, Christ’s spirit, the Holy spirit: – ghost, life, spirit (-ual, -ually), mind. HOW DOES THIS HELP EXPLAIN ANYTHING? What is Yeshua telling Nicodemus? Born of water might to refer to a Mikveh (what Christianity calls baptism). Some will be surprised to learn that Mikvehs were commonplace in Judea when Yeshua walked the Earth. It wasn’t something new that John the Immerser (Baptist) inaugurated (more explanation below). So, when Yeshua spoke of being ‘born again’ Nicodemus would have understood a Mikveh. However, what did He mean by being born of the spirit? Clearly, Yeshua was reinforcing the original instructions from YHVH. Something has to happen in our spirit – our heart – along with the Mikveh (which we can liken to being obedient to His instructions). Deu_10:12 And now, Israel, what doth the LORD thy God require of thee, but to fear the LORD thy God, to walk in all his ways, and to love him, and to serve the LORD thy God with all thy heart and with all thy soul. According to rabbinic literature, a Mikveh (baptismal water) refers to the womb of the world. When a convert comes out of the water it is considered a new birth! It’s a separation from the pagan world. As the convert emerges from the water, those witnessing the event cry, “Born again!” His status is changed and he is referred to as “a little child just born” or “a child of one day” (Yeb. 22a; 48b; 97b). The New Testament uses similar terms as “born anew,” “new creation,” and “born from above,” which all stem from Jewish understanding of a Mikveh (a physical event in conjunction with a spiritual birth)! 1Pe_1:23 For you have been born again, not by a seed that perishes but by one that cannot perish—by the living and everlasting word of God. The ‘living and everlasting word of God,’ is His spirit! For we know that no one has ever seen YHVH, and that He is spirit! We understand from scripture that the word of God is truth. Psa_25:10 All the paths of the LORD lead to gracious love and truth for those who keep his covenant and his decrees. Once we start to define each of the elements, they seem inextricably linked together. We are born again through a Mikveh. 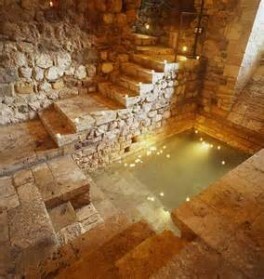 Our physical act of obedience (Mikveh) is evidence of a spiritual rebirth and leads to a changed life! Lev 23:2 Tell the Israelis, “These are my feast times appointed by the LORD that you are to declare as sacred assemblies. Not only do we find joy in the Feasts, Yeshua explained to his disciples the source of his own joy! John 15:10-11 If you keep my commandments, you will abide in my love, just as I have kept my Father’s commandments and abide in his love. These things I have spoken to you, that my joy may be in you, and that your joy may be full. Have you ever noticed how Yeshua explains the source of his own joy by these words? He had a full measure of JOY because he kept His Father’s commandments and it caused him to ABIDE in HIS LOVE. Just consider that a minute. This statement turns on its head all who think that keeping the Law is unnecessary. Yeshua didn’t think it was unnecessary! On the contrary, he understood it to be the source of his Joy! Don’t you want some Joy in your life? Yeshua said that Joy is available to all of us when we ABIDE in His love, just as he did. How is it that we have missed it all these hundreds of years? All of the Law and the Prophets depend (some translations say are suspended or hang upon) LOVE. Love of Father and Love of neighbor and self! And Yeshua prayed that we would know the joy he found in keeping His Father’s commandments! I will close with one of my favorite verses. It is a profoundly joyful verse! It might strike you in a whole new way now that we know the source of Joy! I pray that it will be so! Romans 8:37-39 In all these things we are triumphantly victorious due to the one who loved us.